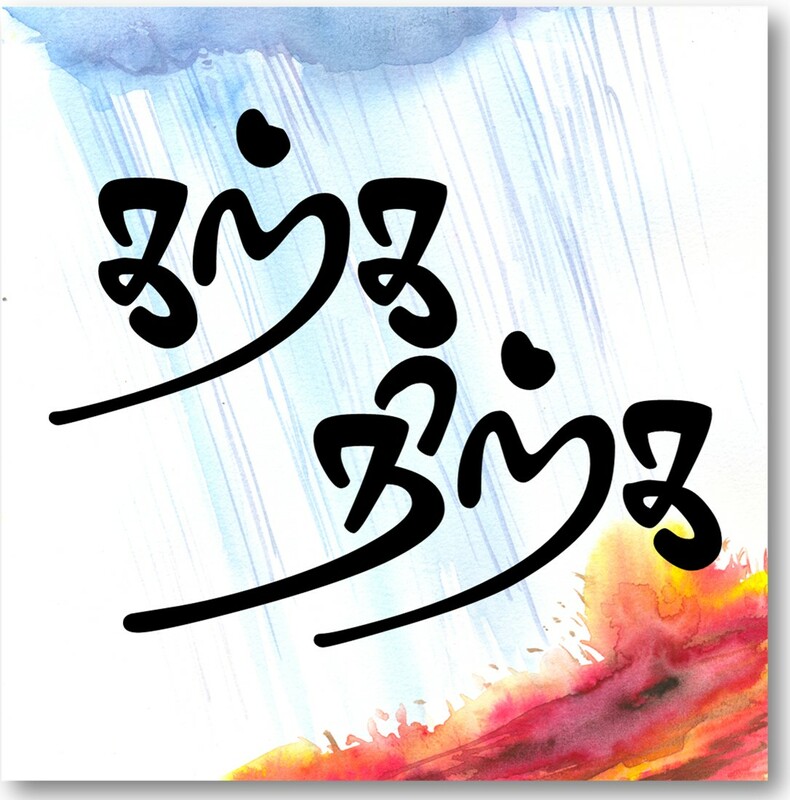 Happy Tamil New Year to all the readers. Printing was known to the Human civilization as early as 220 AD. But the advent of movable printing or the modern printing revolutionized the world of printing. The products of modern printing techniques were more durable and dependable. Mass production was possible. With Industrial revolution spread all over Europe and missionaries and merchants travelling all around the world from Europe, the printing had gained great significance as medium to spread Christian principles. It wouldn’t be surprising to know that the first book to be printed in the movable printing type in 1450 was a Bible famously known as the Gutenberg Bible. Printed books became very important tool for the missionaries who travelled to the third world to spread Christianity. When they moved to other countries to spread their religion, some of the missionaries understood the importance of learning the local language and propagating their ideologies in the local language. Vasco da Gama a Portuguese explorer was the first European to find sea route to India. He first landed in in Kappad, near Calicut on 20 May 1498. Six years after his arrival the process of establishing Portuguese India began. By 1510 then had strong hold along the cost in Kerala and had a permanent settlement in Goa. With establishment of Portuguese India the Jesuits missionaries started coming to India to propagate their Ideologies. Jesuits missionaries were the first to understand the importance of understanding the local Language. Henrique Henriques (1520-1600) is one of the first known scholars to have initiated a scientific study of Tamil Language. He had even proposed erection of a Tamil University as early as 1560 at Mannar or Punnkayil(Tuticorin). It would be a surprising for many to know that Tamil was the first non European Language to be printed in a modern press. The First Tamil book was printed in Lisbon on 11.2.1554 in Lisbon with Romanized Tamil script. 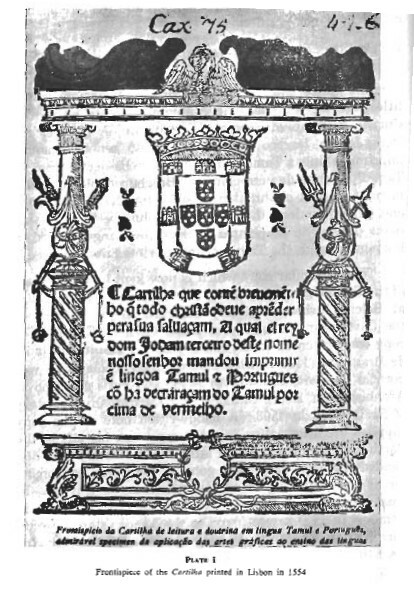 The name of the Tamil catechism was ‘Carthila e lingoa Tamul e Portugues’, by Vincente de Nazareth, Jorge Carvalho and Thoma da Cruz. This was the first time European language was translated in Tamil. This was also the first continuous text in Indian Language to be transliterated into a western script. First printing press was introduced in India in 1556 by Jesuits in Goa. 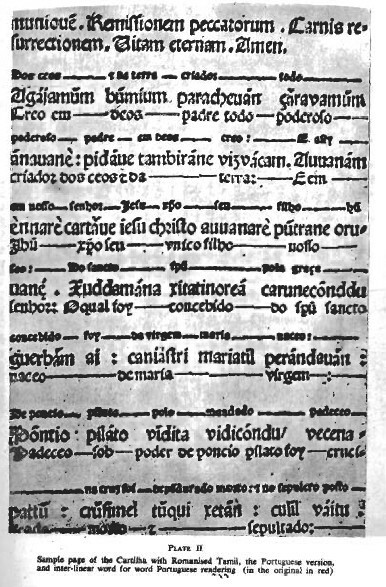 Initial printing was done in Latin and Portuguese. The first known Tamil types were cast in 1577 in Goa by a Spanish Jesuit, Juan Gonsalves. But since they were not satisfactory, new casts were made in Quilon(Kollam) in 1578 by Father Joao da Faria. Impressions of these Tamil letters exist in a book by Henrique Henriques called ‘Tambiran Vankkam’. This book probably the earliest available book in a Indian font. 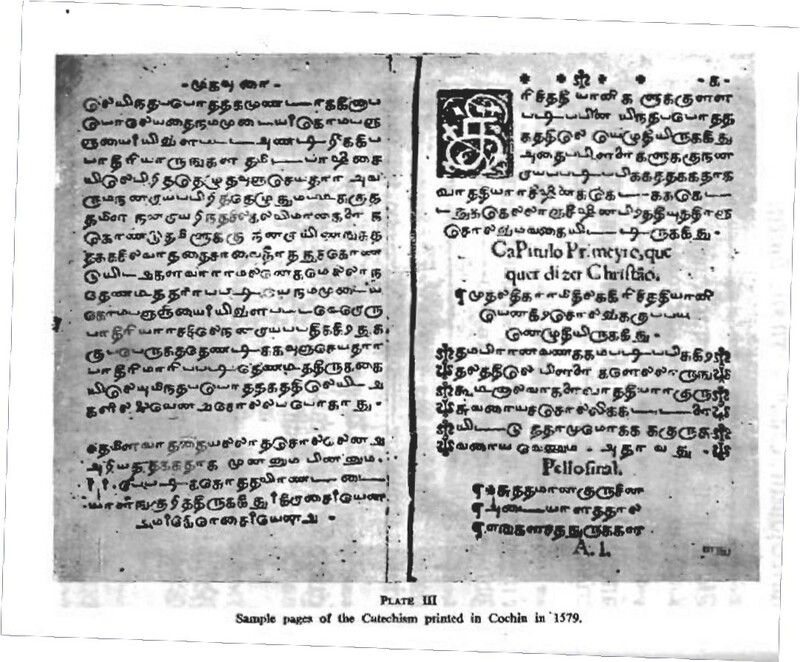 The whole title of the book is ‘Doctrina Christam en Lingua Malauar Tamul – Tampiran Vanakam’.This 16 book of prayers and catechetical instructions were printed in Quilon on 20th October 1578. Tamil Christians in Malabar contributed graciously and set up a press in Cochin and printed ‘Doctrina Christam’ alias ‘Kiricittiyani vanakkam’ authored Henriques in Cochin on 14.11.1579. Around 1586, another book of Henriques, ‘Flos Sanctorum’ (Punitar varalaru of 669 pages) was printed in Punnaikayil (Tuticorin). It would be very interesting to compare introduction modern printing in other Countries with respect to Tamil. And as gift to you all for the Tamil New year I am producing the scanned copy of the 1554 bookelt along with other early books! I hope it was interesting piece of news for all Tamilians. Please pass it on to your friends and spread the legacy of Tamil! Reference and Photos Source: Collected papers of Thani Nayagam Adigal – International Institute of Tamil Studies. Companion Studies to the history of Tamil Literature by Kamil Zvelebil. The chinese who found the paper some three thousand years ago, brought to India too through Bhuddhist ambassodors, but rightly ignored by Indian scholars due to their poor quality to withstand period. The Palm leaves those days have seen more than 100 years life time were proven media, and better than paper. Now Paper and printing technology has reached the most advanced stage, yet withstanding the future period is a doubt unless it is recorded. But your hard work and your great service to tamil is some thing extra ordinary. Fascinating to say the least! As a non-Tamilian I feel proud that an Indian language has had the privilege of being one of the earliest one to be printed. Good work. என் உள்ளம் அடைந்த இன்பத்திற்கு அளவே இல்லை. இது ஒரு அற்புதத் தகவல். உளமார்ந்த நன்றி. உங்களின் தொண்டு பாராட்டத் தக்கது. வாழ்த்துகள். நம் பெருமை உலகறியட்டும். மிக, மிக, மிக, நன்றி; வைரம் அவர்களே! உங்கள் தொண்டிற்கு என் சிரம் தாழ்ந்த வணக்கம் ! It was a delight to see scanned copies of the first printed books in Tamil. Do you think it is possible to get the FULL TEXT of those books online? I have never known this fact about Tamil. மிகவும் பெருமையாகவுள்ளது அண்ணா…. இதற்காக நீங்கள் எடுத்துக் கொண்ட முயற்ச்சிகளுக்கு என் மனமார்ந்த நன்றிகள்! உங்கள் பனி தொடரவும்! Very interesting information about earliest prints of Tamil books. Thanks for the great effort and sharing. Keep the good work going. My Hearty blessings to you for the duty you done for our Goddess Thamizh Annai. World Thamizhargal will proud of you. என்றுரைத்தது மெய்ப்படும் என்று ஐயமுற்றேன் ..
சமஸ்கிருதமே கடவுளின் மொழி என்றான் ..
வட மொழியே உயர்ந்த மொழி என்றான் ..
தமிழன் இல்லத்தில் தமிழை காணோம் ..
Sinbu…hurts my heart to know that the tamils look down at themselves and are ashamed to speak in Tamil even with other Tamilian.Just look at the TV shows in Tamilnadu…the amount of english been used. It is due to their poor self image. We should stop blaming the past and start to invest in the future generation. educate the young minds of the history & beauty of Tamil and lead the way to speak to other tamils in our own language. Every tamilan is proud of the work. Every indian is also prouud of this since tamil is an Indian language. Arumailum arumai. Anbu thamil thenil amutham unpathu pol um tamil seithikal thithithathu! Berthamaleous zigenbelg’in tharngambadil tamil undu tamil Bible eluthi vaaltha kathaium eluthavum. தமிழுக்கும் தமிழர்க்கும் பெருமை சேர்த்த உங்களுக்கு நன்றி அய்யா. Pingback: First Tamil Book – printed in 1554! | சின்னச்சின்ன தூறல்கள்……..
Nice. But do i get this in tamil??? ?